Join insightCuba and experience Cuba's iconic rhythm during this seven-day tour centered around the country's annual Havana Jazz Festival, a tradition since 1979. Join us in 2020, as we celebrate more top musicians and give you a rare look into the thriving Cuban jazz and art scene. During your tour we’ll not only attend evening performances as part of the Havana Jazz Festival, but we’ll take you inside the music scene with special meet-and-greets with musicians, music schools, and other celebrations around Havana. Chucho Valdes, Arthur O'Farrill, Joe Lavano, Dee Dee Bridgewater, Ted Nash, Gonzalo Rubalcaba, Jessy J, Bobby Carcasses, Sandy Shore, Roberto Fonseca, Michael Lington, Harold Lopez-Nussa, Jorge Reyes, Los Brujos, Iba Ibo Yoruba Specimen, The Kansas City Jazz Orchestra, Wayne Wallace, Big Energy Ensemble, Anton Doyle, Doug Martin, CABOCUBAJAZZ, Gryssel Ramirez, Justo Almario, Yasek Manzano and the Cords Quartet, Naat Berahman, Michel Herrera, Ernan Lopez-Nussa, Klimax, Orlando Sanchez, Bellita y Jazztumbata, Emilio Morales, William Roblejo, Alfred Thompson, Habana d' Primera, Mezcla, Jesus Fuentes y Santo Tomas Conection, Oscar Valdes y Diakara, Ruy Lopez-Nussa, Cesar Lopez y Habana Ensemble, Rolando Luna, Javier Salva, Aire de Concierto, Emir Santa Cruz, Jorge Luis Pacheco, Sexto Sentido, Alejandro Falcon y Cubadentro, Ernesto Camilo Vega, Ta Bueno Jazz, Gala Mayor, Habana Sax and more. After clearing immigration and customs at the José Martí International Airport in Havana, you’ll take a short drive to the Meliá Cohiba hotel for check-in and a tour orientation*. At 9:00pm we'll join the opening ceremonies for the 2020 Havana Jazz Festival at the Teatro Nacional. Afterwards, return to the hotel or continue the nights festivities with performances at Fabrica de Arte or Casa de la Musica. After breakfast at the hotel, join a discussion about Cuban jazz, culture, and history with influential musician and musicologist, Alberto Faya. After lunch, we'll meet with the director and students from Las Escuelas Nacionales de Arte Cubano (Cuba's National School for the Arts). Next, we’ll visit meet with Roberto Salas, one of Cuba’s most influential photographers who traveled with Fidel Castro in 1959 to document his rise to power. After dinner, we'll attend Havana Jazz Festival performances. We'll depart for the city of Matanzas and stop at the Bacunayagua Bridge, one of Cuba's most fantastic views. Next, we'll meet with students at the Pastorita Art School. Then, visit Ediciones Vigia, a book publisher that makes handmade paper and hand-bound literary books. After lunch, we'll meet with members of Cuba’s famous folkloric dance group, Afrocuba de Matanzas. Back in Havana, we'll visit Finca Vigia, the home and museum of writer, Ernest Hemingway. Tonight, enjoy dinner on your own followed by scheduled Havana Jazz Festival performances. This morning, we'll go on a street food tour through Vedado while visiting our favorite spots. Next, we'll visit Casa de las Americas, a cultural epicenter, which promotes literary works, artists, and musicians. After lunch, meet dancers in their studio for a salsa demonstration, salsa lessons, and a lot of fun whether you want to dance or not. Next, we'll visit the iconic Hotel Nacional, where we'll learn about its history from a guide and take-in great views of the Malecón and the Florida Straights as you walk its grassy ramparts. After dinner, we'll attend Havana Jazz Festival performances. Explore Old Havana’s labyrinth cobblestone streets for a privately-guided-walking tour of the old city. A UNESCO World Heritage Site, we’ll visit some of Havana’s most important sites including Plaza de Armas, Plaza de San Francisco, Plaza de la Cathedral, Plaza Vieja, and other surprises along the way. After lunch, visit the Proyecto Sociocultura Cabildo Quisicuaba, an association dedicated to resurrecting the neighborhood through arts, culture and spirituality. The neighborhood now boasts a museum, dance studio, and art galleries. After dinner, we'll attend Havana Jazz Festival performances. After breakfast, visit Museo Nacional de Bellas Artes (National Fine Arts Museum) Considered the finest art museum in the Caribbean, the National Museum of Fine Arts holds the largest collection of paintings and sculptures in all Latin America. After lunch, we’ll hop into a restored, pre- 1959 classic American car and go for a slow drive along Havana's scenic neighborhoods. Next, we'll visit the famous Callejón de Hamel, a narrow lane adorned with brightly-colored paintings, sculptures, and murals, paying homage to Afro-Cuban rituals. We'll watch a Rumba performance. After dinner, we'll attend Havana Jazz Festival performances. 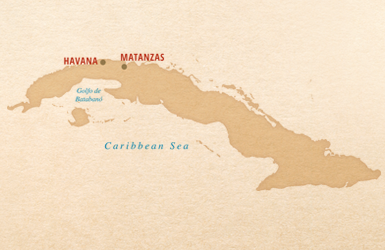 After breakfast, say adios to Cuba as you board your flight home. *Customary end-of-tour gratuities for the guides and staff are left to the guest’s discretion and should be based on your satisfaction with the level of service received. Trip-cancellation coverage available for an additional fee through Allianz Global Assistance. Not included: Airfare and airport transfers. Guests will transfer to and from the airport by taxi. Once you have booked your tour, our flight concierge will gladly assist you with all your flight needs. Call us at 914-380-8303 or click here for an air quote. Please note that domestic and international flight costs are not included in your tour or travel package. We advise arriving in Havana before 3:00pm to ensure participation in the Jazz Festival Opening Ceremony later that evening. Please note that airport transfers are not included. You can easily take a taxi from the airport to the hotel costing CUC$25 (US$30) each way.